The Syrian anti-air missiles which hit an Israeli F-16 early Saturday, Feb. 10, are part of a system operated with and commanded by the Russians from their Kheimim air base. The F-16 was shot down during an Israeli air strike against the Iranian facility at the T-4 air base near Palmyra, which launched a UAV into Israeli airspace that morning. The ongoing clash has therefore gone way beyond an Israeli confrontation with Syria and Iran and marks a serious deterioration in the security situation on Israel’s northern border. It is unlikely that Israel’s attempt through its diplomatic channels to calm the situation and “restore the status quo ante” will succeed. This situation underwent a fundamental strategic change when Iran sent a UAV over Israel from a Syrian base it shares also with the Russians. It may be assumed that the Russian command, which keeps a close eye on all Syria’s air facilities, was in the know about the Iranian operation and was not surprised when Israeli warplanes retaliated. One of those jets was shot down and its two pilots landed safely in northern Israel. One of them was badly injured. 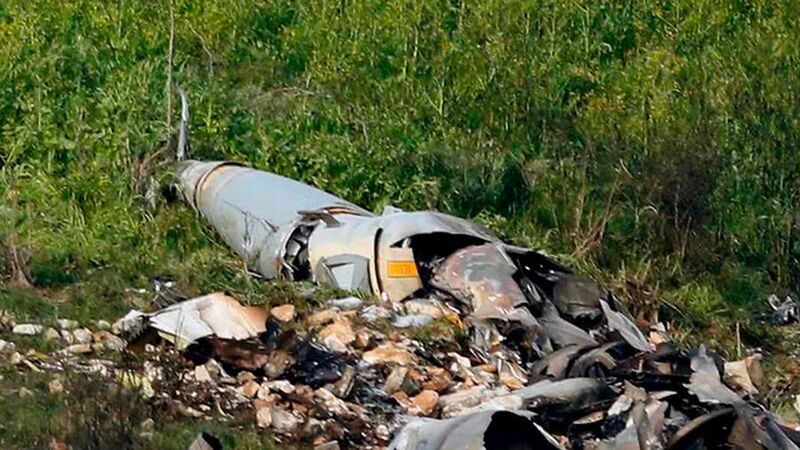 Whether or not the Russians and Iranians discussed likely Israeli retaliation and decided to ambush one of the planes has yet to be investigated. But it is significant that the second, much broader wave of Israeli air strikes against a dozen Syrian and Iranian targets later Saturday morning, was also attacked by air defense missiles that were fired from Lebanon as well. This has brought Hizballah into the Syrian-Iranian-Russian equation, and even the Lebanese army. Civilian air traffic was consequently halted in northern Israel. The parties involved in the incident don’t yet appear ready to call it a day. Each is holding out to have the last word, say DEBKAfile’s strategic analysts. That is exactly what Iran and Syria tried to do on Saturday morning. It is too soon to tell how this confrontation will play out. It is still ongoing. As for Russia, DEBKAfile has repeatedly stressed that the regular dialogue Netanyahu conducts with President Vladimir Putin is of limited value. The two leaders have achieved a certain measure of understanding but, in any situation, Putin is sue to be guided solely by Moscow’s strategic interests – even at Israel’s expense. The issue came up during Russian Foreign Minister Sergey Lavrov’s talks with US President Donald Trump and Secretary of State Rex Tillerson in Washington on May 11, and a day earlier, in a telephone conversation between Russian President Vladimir Putin and Israeli Prime Minister Binyamin Netanyahu. Moscow this week responded to Israel’s concerns about posting Iranian and Turkish officers on its borders to monitor the potential “de-escalation” zones Russia is proposing for Syria. In respect of those concerns, DEBKAfile’s military and intelligence sources reveal that Russia agreed in high-level contacts in the last few days to replace them with Russian military officers in the Mt. Hermon region and the areas where Israeli, Lebanese and Syrian borders meet. The proposal also calls for the expansion of the UN Disengagement Observer Force (UNDOF), which supervises the cease-fire between Israel and Syria on the Golan. The Russian military are preparing to establish four ceasefire safe zones in Syria. The southernmost would be located along Syria’s borders with Israel and Jordan. The issue came up during Russian Foreign Minister Sergey Lavrov’s talks with US President Donald Trump and Secretary of State Rex Tillerson in Washington on May 11, and a day earlier, in a telephone conversation between Russian President Vladimir Putin and Israeli Prime Minister Binyamin Netanyahu. The chairman of the US Joint Chiefs of Staff, Gen. Joseph Dunford, was also involved in the exchanges on the ceasefire zones between Washington, Moscow and Jerusalem during his visit to Israel this week as the guest of the Israeli chief of staff, Lieut. Gen. Gady Eisenkott. On Tuesday, May 9, Dunford said that “Israel is concerned about the possibility of having Iranian or Iranian-backed forces, such as Hizballah, so close to its border.” Both Putin and Lavrov promised that neither Iranian, pro-Iranian, nor Turkish officers would be placed in areas close to the Israeli border. Our military sources report that during talks between Washington, Moscow and Jerusalem on Thursday, May 11, the three sides agreed to continue to discuss the Russian proposal. Another issue raised among them was who will deal with the ISIS forces in the Yarmouk area near the Israel-Jordan and Israel-Syria borders, including the bases established by the Khaled bin al-Walid army, which has sworn allegiance to ISIS. The coming DEBKA Weekly out Friday, May 12, also reveals positive US-Russian dialogue on more Syrian issues. If you are not already a subscriber, click here. There is no word yet on whether the warning issued by the defense minister from Moscow has produced a direct Israeli response to the provocation. Very possibly the five explosions and ball of fire they set off at Damascus international airport Thursday morning may prove to be connected to that response. Early Thursday, April 26, a mixed Syrian-Iranian-Hizballah force embarked on a general offensive in southern Syria ready for a leap on Israel’s Golan border. They moved forward in the face of Israeli warnings that were relayed from Moscow to Tehran and Hizballah. By Thursday morning, it was evident that a decision had been taken in Moscow, Tehran, Damascus and Beirut to ignore Lieberman’s warning. Their first objective is to capture a string of villages held by Syrian rebel groups in the region of Hadar on the Hermon slopes. They are advancing towards the Golan along the Beit Jinn route. Israel is not planning action against Russian forces in Syria, but if the Russian army, whether deliberately or unintentionally, grants Iran and Hizballaha military protection, as they counted on having at T4, Israel would not hesitate to disabuse them. Those events are spearheaded by the pro-Iranian Hizballlah’s drive to capture the Golan in line with its war of “resistance” on the Jewish state. This fixation came into sharp focus the day after the air strike in a rare admission by Hizballah of the loss of a commander. He was named Badee Hamiyeh and was described as having been killed “in the southern Syrian region of Quneitra near the Israeli-held Golan Heights.” This was the first anyone had heard of any recent battle on the Golan. A week earlier, Prime Minister Binyamin Netanyahu and IDF Intelligence Director Maj. Gen. Hertzl Halevi showed President Vladimir Putin in the Kremlin maps depicting the various military movements ongoing in Syria, with the accent on an armored convoy of several hundred Hizballah troops driving out of their Syrian stronghold of Zabadani towards Mt. Hermon. The convoy was clearing a path by overrunning some 30 Syrian rebel villages on the Hermon slopes, which command the Syrian Golan town of Quneitra and the Israeli border. This evidence demonstrated that Hizballah had developed a single military stratagem for threatening Israel-held Hermon, ruling central Golan and gearing up for battle to restore the entire Golan area to Syrian sovereignty under Hizballah control. Netanyahu had hoped that Putin would agree to stop the Hizballah convoy and keep his promise not to let Iran and Hizballah deploy on the Israeli border. However, the Russian leader was unresponsive. Not only were Russian commanders in Syria not instructed to restrain Hizballah, they acted to persuade Syrian rebels on the Hermon and the Golan to surrender to he Lebanese Shiite invaders. Seeing Hizballah on the move unchecked and gearing up for an expeced showdown with Israel, Netanyahu and the IDF decided to take matters in their own hands. They ordered several air force strikes Friday on the relatively remote strategic T4 air base near Palmyra in northeastern Syria and hit several birds with one stone. DEBKAfile’s military sources describe T4 as the main terminal for Iranian planes to land day by day and unload war materials for their own forces as well as the Syrian army and Hizballah.This air base also houses Russian attack helicopters and special operations troops, whose presence there was trusted by Tehran and Nasrallah to be an effective shield against Israeli attack. These developments were the subtext of the video statement by Netanyahu that was broadcast Friday night by Israeli media: “I can assure you that our resolve is firm, as attested to by our actions,” he said. “This is something that everyone should take into account, everyone!.” When he said, “everyone,” he was not just addressing Tehran and Beirut, but Moscow as well. The Kremlin got the message and, a few hours after the Israeli air strikes, Israeli Ambassador Cary Koren was summoned to the Russian Foreign Ministry. There was no official protest, but Deputy Foreign Minister Mikhail Bogdanov firmly informed the ambassador that Moscow would not tolerate any further Israeli attacks on Syrian bases where Russian forces were present. In the course of the raid, Israel’s advanced anti-missile Arrow system made its first operational appearance. IDF chiefs feared that the Syrian anti-air missiles fired against the Israeli jets might fall on a populated location inside Israel and so decided it was necessary to intercept any incoming projectiles. Israel’s military experts got into an argument, which will no doubt go on for years, over whether Arrow’s first appearance in this situation was a good or a bad move. However, the deafening bang that the IDF wonder weapon inflicted on millions of Israeli ears, within a radius of more than a 150 kilometers from the Jordan Valley to the Mediterranean, offered an inkling of how much worse it will be in a full-scale conflict.